Lyle St. Goddard, 56, believes he's one of the oldest hotshot firefighters in the country. "It takes me about a lap to loosen up," he says. Being a hotshot is a young man's game and St. Goddard believes he's one of the oldest hotshot crew members in the country. "I still can do it," he says. "I just got to keep in shape. I'll be okay." St. Goddard supervises the Chief Mountain Hotshots, one of the big employers of young men and women on the reservation. They only hire Natives and they can promise good pay and the chance to travel all over the country. Hotshots are like the special forces of fighting fire – there are only around 100 teams in the country – and Chief Mountain is one of seven Native American hotshot crews. Summer after summer, St. Goddard's team will spend weeks in smoke and heat, hiking up mountains, digging fire-lines and cutting down trees. They have to keep in shape and St. Goddard runs his crew with the discipline of a military unit. They were first called "hotshots" back in the 1940s because they fought the hottest parts of a fire. St. Goddard says it's like battling a monster. "A monster that you haven't seen what it can do," he says. Fighting these "monsters" has become more dangerous nowadays because the climate is changing, the forests are thicker and drier, and there are more homes are in fire-prone areas. "I try to get myself as ready as possible," Dakota Running Crane says. He's a shy 23-year-old with a wispy, blonde goatee. He says too much booze and partying dog a lot of young men in rural Montana. But those bad habits need to end at the chain link gates outside of Chief Mountain's headquarters because the hotshot team doesn't tolerate lateness, drinking or drug use. "It's nice to be on a crew that don't do any of that stuff," Running Crane says. "We don't have to worry about another person being not in their right mind." But you're also gone from your family for weeks which puts pressure on a marriage. A lot of guys end up divorced. You're also putting your life on the line. St. Goddard said it's like back in the pre-settlement days. "The Blackfeet used to go out and hunt or go on war path and be gone for days," he says. "And some of them wouldn't come back. We're no different. In the modern days we go out for 14 days and some of us don't come back." Over the past decade, around 170 wildland firefighters have died while on duty. Chief Mountain has only ever lost one crew member but the risk hangs like the misty, blue clouds over the trail where St. Goddard is running. As he finishes the first lap of his run he tells me he's trying to hit a seven minute mile—and he makes it. But as one of the oldest hot shots in the country, it's getting tougher and tougher every season. "I always say, 'I want to quit.' It would've been this month I could retire," he says. "But I'll go this far with them, might as well go another year." Hotshot crews are the special forces of fighting fire. They're often on the front lines of some of the biggest wildfires in the West. It is extraordinarily hard work. Yellowstone Public Radio's Nate Hegyi brings us this profile of one of the only all-Native Hotshot crews in the country. 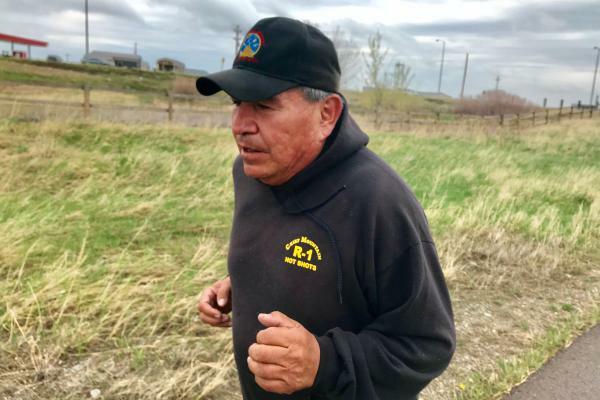 NATE HEGYI, BYLINE: Fifty-six-year-old Lyle St. Goddard is running along a dirt trail on the Blackfeet Reservation in Montana. It's raining. LYLE ST. GODDARD: It takes me about a lap to loosen up. HEGYI: Being a Hotshot is a young man's game. St. Goddard says he's one of the oldest crew members in the country. We're both sweating as I try to keep up with him. ST. GODDARD: I still can do it. I just got to keep in shape. I'll be OK.
HEGYI: Well, you're running at a pretty good pace right now. HEGYI: As some of the younger guys run past, they call him Iron Man or give him high-fives. UNIDENTIFIED PERSON #1: Good job, boss. UNIDENTIFIED PERSON #2: Good job, boss. HEGYI: St. Goddard has been with the Chief Mountain Hotshots for more than 30 years. The Blackfeet tribe runs this crew, and St. Goddard is their supervisor. Summer after summer, the team will spend weeks in smoke and heat, hiking up mountains, digging fire lines and cutting down trees. So they've got to keep in shape. St. Goddard runs his crew with the discipline of a military unit. HEGYI: And just like Marines, Hotshot crews are some of the most highly trained and in-shape firefighters in the world. They run seven-minute miles and can work 16 hours a day on a fire. They were first called Hotshots back in the 1940s because they fought the hottest parts of a fire. St. Goddard says it's like battling a monster. ST. GODDARD: A monster that we haven't seen what it can do. HEGYI: Nowadays, the climate is getting hotter, the forests are thicker and drier, and more homes are in fire-prone areas. So battling these monsters is becoming more dangerous. DAKOTA RUNNING CRANE: I try to get myself as ready as possible. HEGYI: That's 23-year-old Dakota Running Crane. He's a shy guy with a wispy, blond goatee. He says too much booze and partying dog a lot of young men in rural Montana. But those bad habits need to end at the chainlink gates outside of Chief Mountain's headquarters. The Hotshot team doesn't tolerate lateness, drinking or drugs. RUNNING CRANE: It's nice to be on a crew, you know, that don't do any of that stuff or, you know, we don't have to worry about that stuff, another person, you know, being out of, you know, not in their right mind. HEGYI: Chief Mountain is one of seven elite Native American Hotshot crews in the country. They provide good, high-paying jobs in places where unemployment is often above the national average. But as a Hotshot, you're also putting your life on the line. St. Goddard says that lifestyle is like back in the pre-settlement days. ST. GODDARD: The Blackfeet used to go out and hunt or go on war paths and be gone for days. And some of them wouldn't come back either, and we're no different. Like in the modern days, you know, we go out for 14 days and then, you know, some of us don't come back. HEGYI: Over the past decade, around 170 wildland firefighters have died while on duty. Chief Mountain has only ever lost one crew member, but the risk hangs like the misty, blue clouds over the trail where St. Goddard is running. As he finishes the first lap of his run, he tells me he's trying to hit a seven-minute mile. But as one of the oldest Hotshots in the country, it's getting tougher and tougher every season. ST. GODDARD: You know, I always say I want to quit. It would've been this month I could retire. But I'll go this far with them, might as well go another year. HEGYI: And he does because St. Goddard can still run that seven-minute mile. For NPR News, I'm Nate Hegyi on the Blackfeet Reservation in Montana.  SIMON: That story was brought to us by The Mountain West News Bureau, a public radio collaboration. Transcript provided by NPR, Copyright NPR.